How do I help empathic children shield themselves and calm down? How beautiful you are supporting empathic children. Teach them to breathe out negativity and stress whenever they pick it up and how to picture a shield of white light around their bodies when they are in stressful situations. Also teach them not to hug or look deep into the eyes of people who they get a bad feeling about but instead go towards positive people who have heart. Empathic children have nervous systems which react more quickly and strongly to external stimuli including stress. Sometimes they feel too much but don’t know how to manage the sensory overload. They see more, hear more, smell more, intuit more, and experience emotions more. You need to know what overstimulates your empathic children and avoid those activities. Doing so calms them and wards off exhaustion, tantrums, and anxiety. Common triggers include: excessive busy-ness such as overscheduling their day without breaks, multi-tasking, no alone time, and violent television programs or newscasts especially at night. Following exposure to any of these factors, children might find it harder to fall asleep and require more down time before bed to unwind. 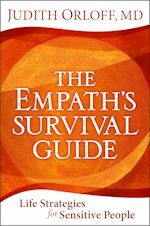 I also recommend reading my book, The Empath’s Survival Guide as I have a chapter in it on raising empathic children.